SIA is starting a new medium to long haul budget airline sometime in 2012. The proposed new airline, which will use widebody aircraft to fly medium and long-haul routes, will be wholly owned by Singapore Airlines but will be operated independently and managed separately from SIA, the carrier says. The new carrier will likely compete with Jetstar Airways, the low-cost unit of Qantas Airways, and AirAsiaX, the longer-haul unit of Malaysia's AirAsia, for routes beyond the reach of traditional low-cost airlines that don't fly for more than five hours. In a statement, chief Executive Goh Choon Phong said: "We are very excited about what our new low-fare subsidiary will offer to consumers. We are seeing a new market segment being created and this will provide another growth opportunity for the SIA Group. "As we have observed on short-haul routes within Asia, low-fare airlines help stimulate demand for travel, and we expect this will also prove true for longer flights." The new airline will start operations with a fleet of aircraft transferred from Singapore Airlines, Nicholas Ionides, the company spokesman said . Longer term fleet decisions will be made later. The proposed airline won't hurt the business of its parent or of Tiger Airways Holdings, in which Singapore Airlines holds a 33 per cent equity stake, Mr Ionides said, adding that the company has no plans to reduce its stake in Tiger. As for other details like routings,branding, logo, staff and crew or it's CEO, SIA has not given information. My guess is the cabin and cockpit crew would come from the present bunch of people,especially the cabin crew. 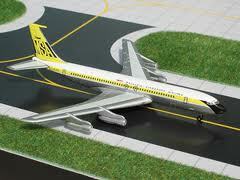 They would probably made up of crew who had finished their contarcts and retired cabin crew. Their instructors would probably be people like Boh Tong and some of his former more capable colleagues...hehehe tan ku la. Logo wise it could like the one above which was the defunct MSA (Malaysia S'pore Airlines). SQ could tweak it a bit,change the colour and make it look slightly different.You may call it "Majulah Singapura Airlines or My Singapore Airlines or better still Merlion Singapore Airlines". Malaysia protested after MSA split in October 1972 to Singapore's desire to use it's logo and 3 letter coded. 39 years on, I don't think Malaysia would mind anymore (perhaps they had forgotten about the issue). The accommodation for crew who stop at outstations could be 3 star hotels or even 5 star if so desired but have to share room to save cost. Salary and allowances should be less than the main carrier staff and crew. If union demands higher salaries then it should recruit staff and crew from third world countries. As for capital, SIA could raise it through the stock market. Yes, float the shares like how it did with Tiger Airways. The inflight service will be minimum and f & b would be sold on the flight. Paxs are not allowed to bring "outside food" to the aircraft, so no tar pow ok! Minimum number of cabin crew would be carried to look mainly after paxs' safety eg on a B747 flight maximum number of cc would be 12 (there are 12 doors). This would be tailored to the number of paxs on the flight i.e if lesser than a full flight then less than 12 cc would be carried. Destinations would most likely be northern China and India. There will be a few flights to Europe and Latin America. Most likely routes are Australia, Japan, Middle East and china. Workers matured like Boh Tong. They are more commited and dedicated in their work. Young ones will job hop so point point in employing them. Hotels will be 3 star and only 1 night layover. So lets see the take up rate? Do you think anyone is keen to apply? $3000 just to open/close door? Thats $100 a day ..
Me too I don't mind doing it for $100 a day. Sure la has to make money from sales of nasi lemak,mee siam etc. Like that the cheapos won't be eating or drinking so less work for crew loh. Got Char kway tiao with see hum or not? Or mabbe spam sandwich? Mee siam mai hum lah. Where got people eat mee siam with hum?